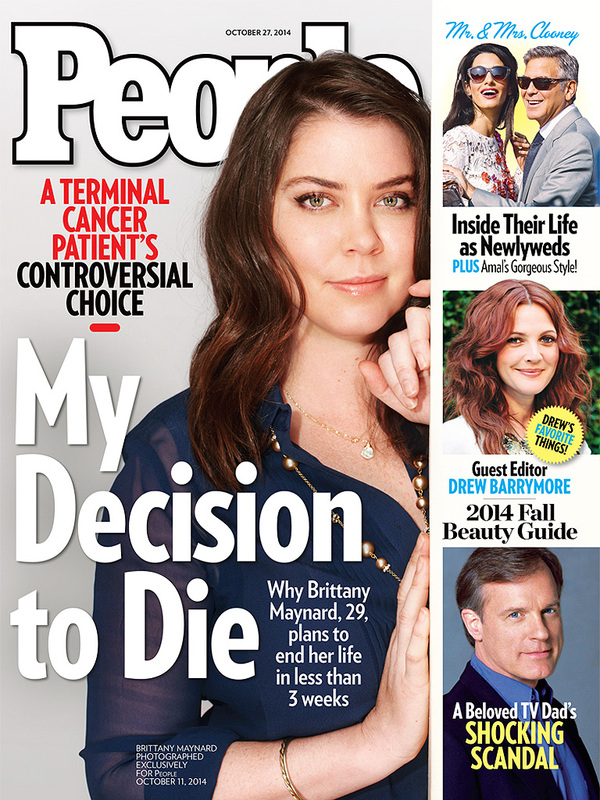 Sorry that this is a bit off-topic, but I’ve been following this story about 29-year-old Brittany Maynard who was diagnosed with stage 4 brain cancer. She moved from California to Oregon because she wanted to end her life (legal in Oregon) rather than suffer through a longer and painful death from the spread of this terrible disease. I completely sympathize with her and other victims of terminal illnesses who want to “die with dignity.” If I were in their shoes I’d probably do the same thing. What bothers me about this is how the media treats it. Let’s call Ms. Maynard’s decision what it is – suicide. The media treats her decision to end her life as something noble and admirable with fawning coverage from major newspapers to supermarket tabloids to morning television. She is very telegenic and, again, I mean this in a very sympathetic way. I’m sure that the media will salivate over Ms. Maynard until her final moments, and I wish her and her family the very best. This is a terrible decision for a young woman to make. I just wish that my daughter and so many other victims of suicide (most recently, Robin Williams) were accorded the same degree of respect. Dying With Dignity Versus Suicide was originally published @ Parenting and Attachment and has been syndicated with permission. There is no such thing as dying with dignity. In any state/condition humans find themselves to be in, dignity is a choice–it’s not something you lose when you become terminally ill, or mentally incapacitated, etc. Every human being has the right to be respected. There is no such thing as dying with dignity. In any state/condition humans find themselves to be in, dignity is a choice--it's not something you lose when you become terminally ill, or mentally incapacitated, etc. Every human being has the right to be respected. With all due respect, and I’m sorry you lost your daughter, but are you really comparing being told you have a few weeks to live and that you’ll die an excruciating death to being suicidal? I am not in any way diminishing the pain that someone who is suicidal goes through, but they’re two totally different situations. With all due respect, and I'm sorry you lost your daughter, but are you really comparing being told you have a few weeks to live and that you'll die an excruciating death to being suicidal? I am not in any way diminishing the pain that someone who is suicidal goes through, but they're two totally different situations. Alexis, I do not think John is saying that someone committing suicide is the same as someone wanting to end their life because they are diagnosed as terminal. Writing is an outlet for John and for his loss; part of the bereavement and grief process. To have an only child commit suicide, I can only imagine as being devastating, shocking, makes one angry, makes one sad, makes one grieve. Suicide and assisted suicide share a few things-a person wanting to end their life, but for very different reasons; a person deciding the pain whether mental of physical is too great and unbearable. Alexis, I do not think John is saying that someone committing suicide is the same as someone wanting to end their life because they are diagnosed as terminal. Writing is an outlet for John and for his loss; part of the bereavement and grief process. To have an only child commit suicide, I can only imagine as being devastating, shocking, makes one angry, makes one sad, makes one grieve. Suicide and assisted suicide share a few things-a person wanting to end their life, but for very different reasons; a person deciding the pain whether mental of physical is too great and unbearable.